Lois Annis is purchasing the rights of the land of his deceased father from his siblings in a quit claim deed for the sum of $11. This is a common form of quit claim deed. 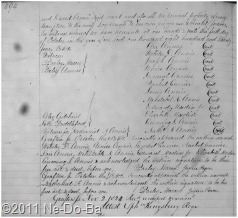 In essence, the children of the late David Annis are giving his land to their brother, Lois Annis, for a very small sum. What is the importance of this deed as it related to the Marden family? First, it establishes the marriage of Edward Marden to Elizabeth Annis. Second, it tells us the Edward Jr. has moved away from Lyman and is living in Dalton by 1824. Third, it may be useful to know names of Elizabeth’s siblings as I begin to dig deeper into Edward Jr..